Jaguar has just unveiled one of the wildest vehicle technologies ever seen. Officially known as “Follow-Me Ghost Car Naviagtion,” the brand new technology system projects an illuminated “ghost car” out in front of the vehicle, allowing the driver to sit back and relax while the Ghost Car leads the way by making all of the appropriate turns and stops. 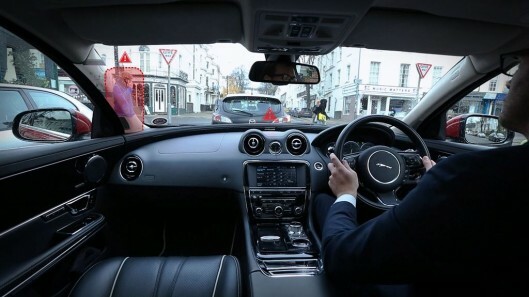 “Driving on city streets can be a stressful experience, but imagine being able to drive across town without having to look at road signs, or be distracted trying to locate a parking space as you drive by,” said Jaguar Land Rover’s director of research and technology, Dr. Wolfgang Epple. In addition to the “Ghost Car,” the system also projects a series of strategic information onto the windshield, including parking guidance, stop light duration, and geographic landmarks. This, of course, is a technology that has become fairly popular in more and more newer model vehicles. Currently, there isn’t a release date set for the technology, but there are rumors floating around that it could be featured in the next generation Jaguar XJL Portfolio or Range Rover Autobiography. This entry was posted in Culture, Jaguar and tagged ghost car, Jaguar, navigation. Bookmark the permalink.